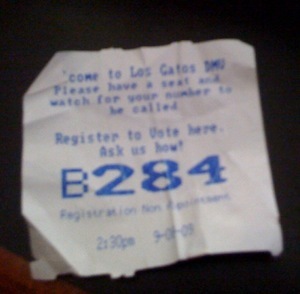 Yesterday I went to the DMV office in Los Gatos with a friend, to transfer the title of a motorcycle. We arrived around 2:20, and stood in line for about 10 minutes, just to get our 'number'. The entire building was packed. The line for numbers went out the door. There were scores of people milling around outside - including children and dogs. My number was B284. They were serving B191 at that time. We went to get some lunch. While there I pulled up the Los Gatos DMV website, which helpfully gave the average wait time for non-appointment visitors as 2 hours 33 minutes. The next available appointment: two weeks out. Around 4:20, the number finally came up. We lucked out, only two hours! When we got to the station, a very nice, very helpful lady showed how to fill out the paperwork. I think there were three different forms. Two of them required filling the name, address, 20-digit VIN, plate, and driver license number, and most of this info was repeated on the other side. A third form required all the same info, along with an engine number, luckily only on one side. I asked our kind public servant why it was so crowded, and she pointed out that it was the day after the Labor Day weekend. And she also mentioned they "had a lot of no-shows" (i.e., employees not bothering to show up for work). We finally left around 4:35 - total experience of roughly 2 and a half hours. Now, many of you are thinking - "Hey, you got off pretty easy" - and I agree - I have had much worse DMV experiences. But bear with me for a moment while I make a modest proposal. Let us note that the total amount of work done by the DMV is constant - the vast majority of people going to the DMV have no choice but to transact their business. Near where I live is a Fry's Electronics store. It has over 60 registers for checking out. The typical wait in line at Fry's is usually only a few minutes. Fry's has an incentive to move customers through. But there's another line at Fry's: the returns line. That line is often loooooong. It's easy to see why - Fry's wants you to buy things, but doesn't want you to return things. So they 'push back' and make you pay a price for it - your time in line. The DMV is not like Fry's returns line. No amount of discouragement will send the customer away. They have no choice but tolerate whatever experience the DMV has to offer. But there's no reason for long lines! All that time spent by 2/3rds of the population of the state is a deadweight loss. Why? Because the work has to be done. The DMV can process it in a timely manner or an untimely manner. They can arrange to have more employees at busy times, or not. Without any incentive to improve service, they won't. (Or rather, they'll improve service just enough to keep from losing their jobs). Let's say that in a given year there are 20 million man-hours worth of work to be done. This work will be done, the employees paid for it, etc.. regardless of whether the average wait time is two hours or ten minutes. It can be done by 10,000 full-time employees in 2000 hours, or 20,000 part-time employees in 1000 hours, or any mixture of the two. The cost to the state is roughly the same. The only way to really cut the budget for the DMV is to improve service. The state should franchise out the DMV to private business. Give the contractor a fee per customer processed. If necessary, put the reward on a sliding scale based on the average wait and processing time. Save untold millions in wasted customer time, cut back on heart attacks, DMV rage, etc... make the world a better place. Crazy idea, huh? Apparently it's been done in some states already. "The average wait time at Ohio's private Northfield-Macedonia License Bureau is under 10 minutes. Even during a lunch hour visit to another franchise outside of Columbus, which is slightly larger than Portland, the wait was approximately ten minutes." "According to the Oregon DMV, average wait times in 1995 at the States twenty-five busiest offices were nearly five times longer. At Portland-area offices the average wait was 77 minutes. Even though Oregon DMV state-wide average wait times declined to just under 20 minutes during May 1996, that is still double the wait times at the two private franchises in Ohio." Here's the license bureau mentioned: the Northfield License Bureau. If you're thinking about starting such a business, I have a suggestion. California Driver Licenses have a magnetic strip on them. I assume it must record some kind of information making it possible to pull up DMV records on the individual. Instead of filling out the same data repeatedly (so that it can then be subject to erroneous data entry), why not just swipe the license through a reader? Then print the form out, and have the customer sign on the dotted lines?